Location: Enniskillen, County Fermanagh, Ireland. Notes: Castle Coole is a townland (of 529 acres) and a late 18th-century neo-classical mansion situated in Enniskillen, County Fermanagh, Northern Ireland. Set in a 1200-acre (5 km²) wooded estate, it is one of three properties owned and managed by the National Trust in County Fermanagh, the others being Florence Court and the Crom Estate. The townland is situated in the civil parish of Derryvullan and historic barony of Tirkennedy. 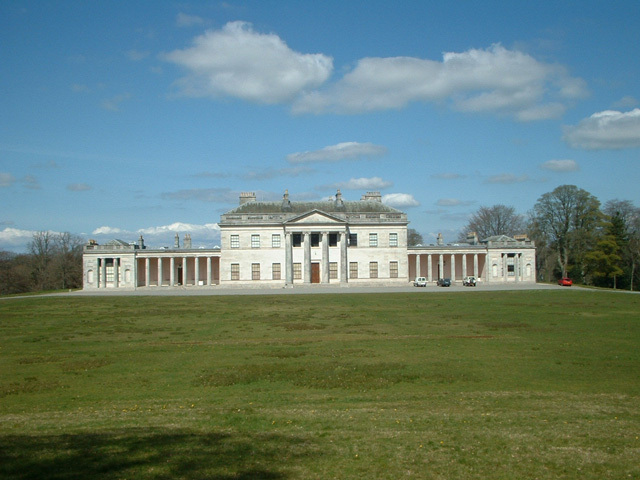 Castle Coole re-opened to the public for the 2006 season on 17 March. A re-design of the Victorian Bedroom layout now commemorates four years of Australian influence at Castle Coole. Somerset Lowry-Corry, the 4th Earl Belmore, became the Conservative Governor of New South Wales on 8 January 1868 and served until 23 February 1872. At Government House, Sydney, the 4th Earl's first son was born on 1 May 1870, later to become the 5th Earl Belmore. Lady Belmore found the summer climate of Sydney oppressive and despite frequent retreats to Moss Vale, concern over his wife's health prompted the Lord Belmore to resign his governorship on 26 June 1871 allowing the Belmore family to return to Castle Coole the following year. Belmore Park, Sydney and Belmore Park, Goulburn testify to New South Wales railway developments brought about by Lord Belmore's governorship and his own personal popularity in Australia. As the bedroom of the 4th Earl and Countess at Castle Coole both prior to and following their four years in Australia, the Victorian Bedroom commemorates the connection. Admission to Castle Coole is by guided tour only. Please consult the National Trust's webpage via the external link for opening times in 2013.